Bailey’s was my favourite until I discovered Coureur des Bois, it’s maple flavoured Irish cream liqueur! Friday: Bowling with friends – sounds innocuous, but of course there was drinking. Nothing too bad, a couple Bailey’s and some spiced rum and diet coke (a favourite combination of mine). I was good with eating all through the day and even had a big salad for dinner. But come 11:30 I was starving and wanted nachos… because nachos are the best. These particular ones were smothered in cheese and I ate probably more than my fair share. Saturday: This was my boyfriend’s day with me to himself. We attempted to make these diet pancakes, but they were sticking to the pan like crazy until with switched to butter instead of coconut oil. That seemed to work better. 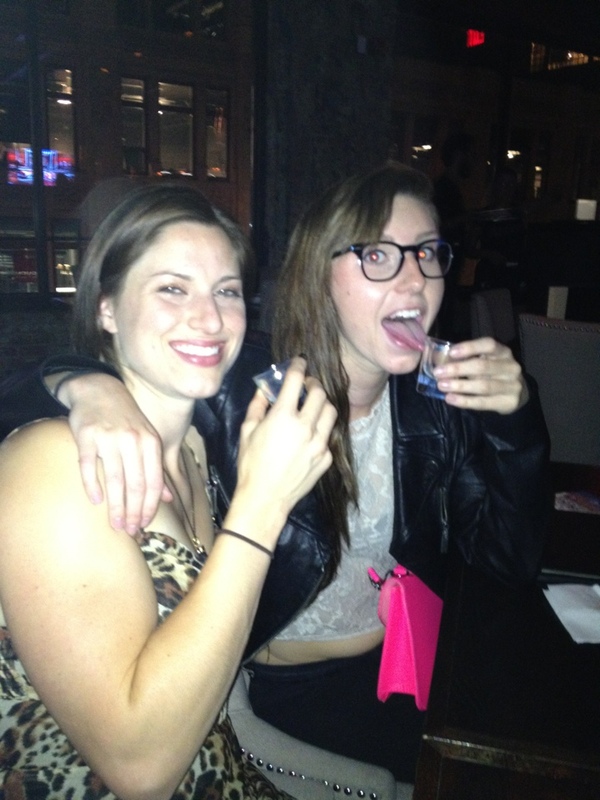 Then I got surprised with going to see War Horse, which was super sad, followed by dinner at Brassaii. I had Oysters to start, Bison Tenderloin with a wine reduction sauce, fingerling potatoes, broccolini and king oyster mushrooms as my main and a chai pot de cream for dessert. The Dessert was nothing spectacular, but the rest of the meal was to die for! The bison had a bone marrow crust that gave it the perfect amount of saltiness, cooked to perfection and oh so tender! We then went to the Sheepdogs’ concert and met up with my family. Such a wonderful day, and not that unreasonable as far as the diet goes. 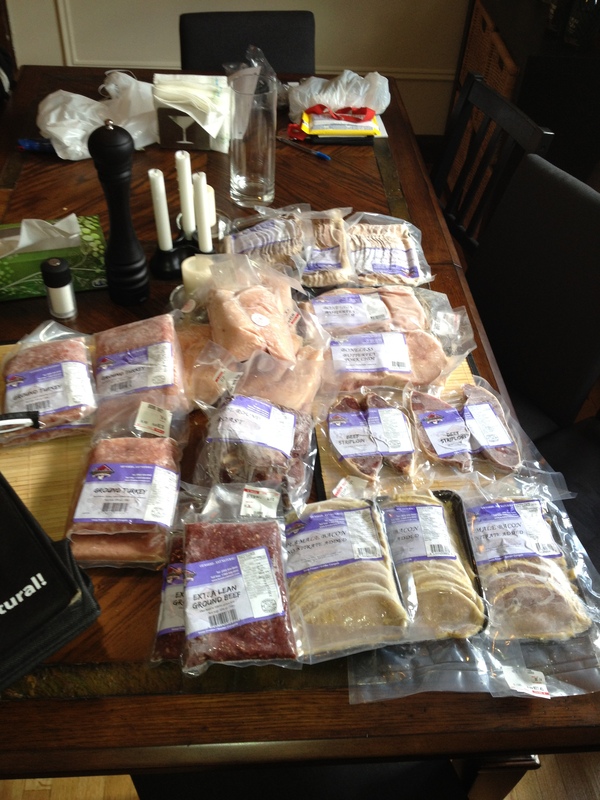 I also got the meat that I ordered from Brooker’s delivered Saturday morning… happy birthday to me! Sunday: This was the kicker. It started out with some gluten-free French Toast made with what is left of the loaf from this post, accompanied with some pasture raised peameal bacon, so that was good. Then we went to Ikea and picked up a wardrobe for our new apartment which was my birthday present/housewarming gift from my wonderful parents. Then out to Bowmanville for apple picking! I love apple picking, it’s such a very fall thing to do, and they had Honey Crisp apples which are my absolute favourite… they are huge and sweeter than most apples. Back to my parents house with my uncle’s family and my Grandma for an absolute feast of guacamole, steak, corn on the cob, roasted sweet potatoes, grilled veggies and some wonderful red wines including Amarone. For dessert, as always, I requested Angel Food cake… this is not gluten-free, but it is my favourite all time dessert, airy and sweet and moist. My Grandma’s been making this since the 1940’s and my Mom uses the same amazing recipe. I think I ate half a cake and lo and behold, I had a major stomach ache because of it. I don’t recommend huge doses of gluten even on your birthday, if you are sensitive to gluten, but it was heavenly (pun intended). So that brings us to today. I am a little less than 6 weeks out from my competition and have just had a majorly unhealthy weekend which has upped my weight by about 4 pounds (yes, this is mostly water). Should I feel guilty? I don’t think so, it was my birthday, and I indulged more than I ought to, but that’s life. So what should I do about it? Well for starters, I am getting right back into eating clean. I am lowering my carbs a lot this week as I ate a lot of carbs over the weekend. Today, I am fasting until I feel properly hunger, I woke up still absolutely stuffed from last night, so I just took my vitamins, Bio K (probiotic), and had some water. I am writing this with a coffee in hand and still am not in the least bit hungry at 10 am; considering I usually eat at 7am this is unusual. If you look at my Tips and Tricks you will see I never recommend skipping meals to make up for overindulging. Feeling guilty about eating will make you resentful and you will probably enjoy those indulgences less. But fasting can be useful if it is not tied to guilt. I have been doing some research on different fasting protocols, and I’m not entirely convinced it’s a lifestyle I want, there are some definite benefits. A major reason I am fasting today is because of the amount of gluten I ingested over the weekend. My organs are actually in pain (not exaggerating) because I was basically giving them poison. Fasting can be very therapeutic and cleansing in a case like this where you have just taxed your digestive system. Giving it a break from processing anything, even good food, allows it to deal with all the crap you just fed it and reset. Then when your next meal is full of nutrients, your body will be ready to handle them and will process it much more effectively. If you want to learn more about different fasting protocols there are lots of websites out there, but I found the Precision Nutrition summary to be particularly well researched and informative. An important thing to mention if you are going to try intermittent fasting is that nutrient timing around exercise to still very important. Typically, people following a fasting protocol will exercise either fasted, or with a small meal before exercise near the end of the fast, followed by a large meal right after the exercise. This limits muscle wasting and makes the best use of calories in that magical hour after exercise where your body processes food like a machine. fasting can be beneficial for getting rid of evil gluten and helping to get your body back on track if you don’t link it to emotions.